In light of the many questions raised by readers after the last article on the HDC’s purchase of land at ‘Eden Gardens‘ in Calcutta Settlement, I am continuing there. The State is a unique player in our country’s land arena, so we need to place this Calcutta Settlement episode into proper context from a land administration viewpoint. So, if the State intended to construct affordable housing in Central Trinidad, it could have chosen from the abundant State-owned property in the area, granted planning permission for its own proposed development and provided services. The State could only have bought the ‘Eden Gardens‘ land by ignoring sound land administration principles. Elementary policy was ignored in favour of sheer expediency, or worse, the enrichment of carpetbaggers at the expense of the Public Interest. What was the advice of the Commissioner of State Lands on this transaction? Was his advice sought? Bizarre and expensive precedents are being set in situations of zero benefit to the Public Good. This deal is detrimental to the Public Interest. At a level of State policy, there was a collapse into expedience and a continuing silence as to the role of ‘Eden Gardens’ in the national housing policy. But when I delved into the documents in my possession, there were even more causes for concern. Deed # DE2010 003449 63D001, PLP mortgaged the property to said Sookdeo Deousaran for $18.5M at 8%, to be repaid on the last day of January 2012. These purchasers were prepared to pay $17M for this undeveloped property in mid-2004, but ended up paying only $5M for it in early 2010. On the same day, they mortgage it for $18.5M. By happy coincidence, or otherwise, the property with infrastructure added was offered to the HDC at $200M in late January 2012, two years later. Literally unbelievable. What is more, the fact that the second and third of those deeds were executed on the same day is deeply perturbing as to the operation of the Stamp Duty section of the Board of Inland Revenue. The second deed transfers the property for $5M and Stamp Duty is paid on that, yet the third deed shows a mortgage granted the same day on the same property for $18.5M. Normal practice in the finance world is for a mortgage to be taken on a property at some fraction of its current market value. Both those deeds were registered at the San Fernando office of the Registrar General’s Dept. If there were a reasonable gap between the first sale to PLP and the new owners mortgaging the property, it might be possible to claim some increase in value due to its physical development or obtaining permission to develop. But since both transactions took place on the same day, there is no way anyone can claim a genuine difference in value. The 8% interest rate on the two-year mortgage is instructive, in that the actual rate at which finance was offered at that time for similar projects was in the 10.5-12.0% range. The reasonable conclusion being that both sides had a high degree of comfort with each other, indicative of close collaborators. S.84 of The Conveyancing and Law of Property Act (1939), states that the penalty for falsely stating the consideration in a deed is a modest fixed fine and a further penalty payment of 5 times the amount of the understatement. Those penalties apply to both the buyer and seller, perhaps to discourage these dishonest practices. The Act goes further to offer the penalty payment as a reward to the person making the report of the understatement. S.86 of that Act also specifies a small fixed penalty for an attorney found guilty of “…knowingly and willfully…” recording a false consideration and mandates that the said attorney “…shall…” be disbarred. Of course an attorney who had prepared only one of those deeds could reasonably claim to be genuinely unaware of the entire transaction, so we will see. Sad to say this ‘Eden Gardens’ scheme is reminding me of the CL Financial antics. I am thinking about the the affidavit of the Inspector of Financial Institutions stating that Clico Investment Bank did not file its Corporate Tax returns for 2007, 2008 and 2009 and the fact that, despite those lapses, they were able to obtain a bailout on ‘sweetheart terms‘. The Eden Gardens chiefs were able to understate the property value to avoid the true level of Stamp Duty, but were also able to get Cabinet to agree to effectively bail them out, also on ‘sweetheart terms‘. 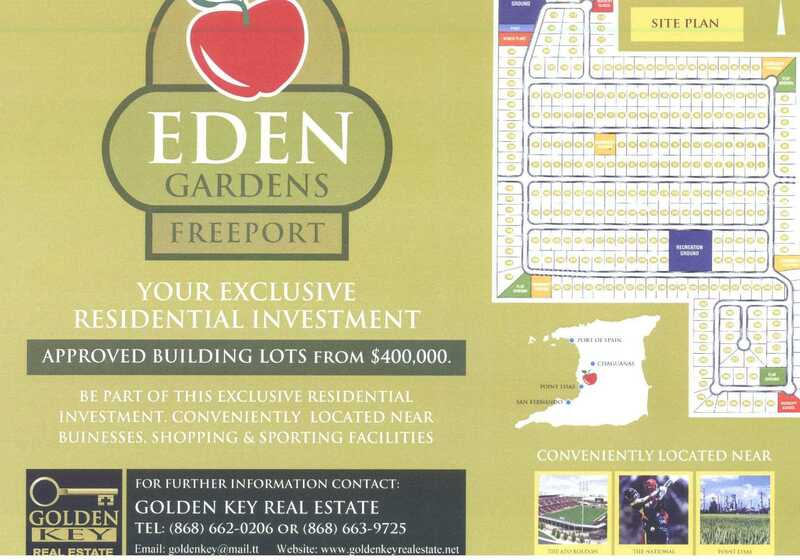 Always remember that the land at ‘Eden Gardens‘ cost $663,000 per lot as agreed by the Cabinet, seemingly unaware that the developers were offering lots there for sale at $400,000 only months before. The HDC purchase was completed on 9 November 2012 and recorded in DE 2012 026026 11D001. The para before the $175M sale price is the one which specifies the 2010 deed for $5M, just so. I approved of the diligence of our AG in challenging the legality of the THA’s BOLT project. This ‘Eden Gardens‘ scheme is also in need of urgent investigation, so we will see. My final point is that all the information cited in this article is available on the internet, so where is the basic due diligence? These sorts of schemes should not even get past the first gatekeeper, far less into the Cabinet for consideration. We disrespect our own integrity when we remain silent on issues of public impropriety. We disrespect our national integrity when we pretend that these issues are beyond the scope of our own mechanisms of redress. We disrespect our regional and international neighbours and friends when we allow one person to shoulder the responsibility for investigating, providing witness testimony and publishing the whole on his time, with his money and risking his safety if we do not publicly show our support for the scrupulously propitious, superlatively lucid and painstakingly chronological challenge to the fraudulent misappropriations of taxpayers money by politicians and their imps and harpies masked as humans. Afra must know that he is supremely loved, wholeheartedly appreciated and unreservedly supported by the people he represents. We must not allow deceit to govern regardless of which “Sin Phony” they conduct. At 50 we deserve at least self-respect. I shall quote Denis Solomon in part: “A republic…is a state whose polity proclaims the determination of a people to govern itself without the trappings of divine or pseudo-divine authority.” Express Mon 4th Feb. 2013 page 13.